I know I haven't written much the past month or two. I've been getting out consistently during that time because the woods are so close to my new place, but I just haven't had time to write much about anything. Well, this past weekend I got the urge to go fishing, and I figured it's about time I posted something about it. I've been doing a bunch of fly fishing lately, and it's been getting a bit tedious, so this weekend I wanted to do some spinning. I also wanted to go up to the Catskills and explore some areas I haven't visited before. The challenge with that is that there are very few lakes in the Catskills. There are a few good locations, but they are overdeveloped. Access to them is pretty easy because people bring boats to the lakes, which makes them feel less secluded than I like. So, I took out a map and started looking at bodies of water that were nowhere near any roads. 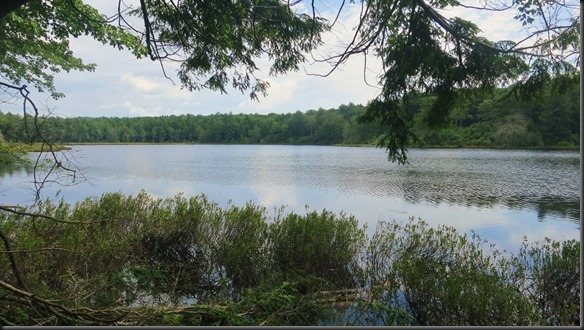 The lake I settled on was a 15 acre body of water called Long Pond located in the Willowemoc Wild Forest in the Catskill Mountains. I knew nothing about it except that it was small, there was no road access anywhere near the area and that I would have to backpack a fair distance to get to it. When I left in the morning it was raining heavily. 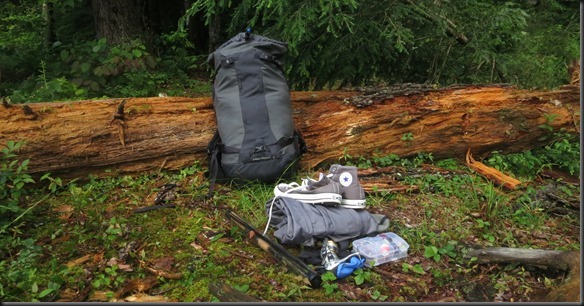 I got all my rain gear ready, but by the time I arrived at the trail head, the rain had stopped and the sun was out. I headed up the mountain towards the lake. I followed a trail most of the way up, cutting across the woods at the very end to reach the lake. The climb was steeper than I had anticipated, but it wasn't anything challenging. The rain from earlier in the day had brought out some of the animal. I reached the lake in good time. As I mentioned earlier, I really didn't know what to expect. It quickly became clear why no one seemed to fish this lake. Not only was there no easy way to get to it, but there was virtually no shore access for easy fishing. The lake is a good size, but at least this time of year is surrounded by a bog with a few marshy areas. All the open greenery you see is not actually soil, it is just plants growing directly out of the water. Luckily, I was prepared. I suspected this might be the case, as it is with many of the small bodies on water around here, so I brought along my waders and DIY wading shoes. I also brought a heavier reel and move complete tackle than my usual portable kit because I was specifically coming to the area to fish. There were a few location along the shore that weren't overgrown with brush, so I picked the widest one and started making my way through the bog. It?s the most difficult time I've ever had getting into a lake, sinking significantly into the bog. The bubbles you see all around me in the picture above are being released from the bog as I am pushing down on it. Right there my legs are at least a foot deep into the mud. Anyway, I got the hang of moving around after a while and got to fishing. I was using a gummy weedless set up. I?m assuming it?s because there isn't much pressure on the fish here, but I started getting hits right the way. They were all pickerel. The first few I caught were too small to keep, about a foot each. Around here they have to be at least 15 inches to keep. After a while I hooked one that was much bigger, and it snapped my line. I was surprised as I was using my bigger reel with 8lb line, but it snapped it. I reset with the exact same set up and kept going. Eventually I hooked an 18 inch chain pickerel that I managed to get out of the water. To top it off, I even found some blue berries in the area. At that point I figured I would call it a day. I cleaned the fish, which was a pain because it is a slimy one, packed up and moved south along the lake. In the late afternoon I stopped to eat dinner. When I am cooking something like fish that has a strong smell, I like to do it away from where I will be camping during the night. It is almost certain that a bear will come check out the smell, and having to chase away a bear in the middle of the night is not fun. 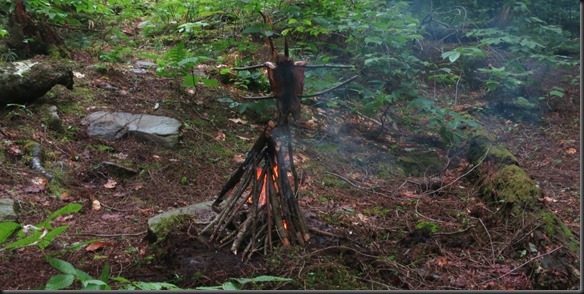 So, I made a small fire and cooked the fish along with some other food I had brought along. After dinner I moved on for about another half a mile. There were quite a few game trails in the area, so walking was easy. 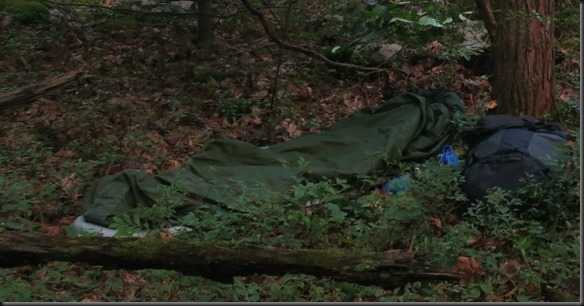 When the sun started going down I pulled out my pad and sleeping bag and went to sleep. The night was very warm. The next day I packed up and headed home. Originally I was planning on doing some more fishing, but I just didn't feel like trying to make my way into the lake again. Following the trail down the mountain, I crossed a small creek, so I took the opportunity to wash up. I wasn't able to reach the lake water after I took my waders off, so my hands were still covered in fish. After that it was a short distance out of the forest. And that?s it. A little fishing, a little camping, and all around a good time. Looks like a really neat place to hang out. Thanks for sharing the trip. That's a cool looking fish. Supposed to be a blast of fun to catch. Great trip Ross. We have the same problem with weeds on our shorelines on remote lakes and ponds. Except when you find a trail like you used we may find its a path to a gators nest. Makes it a little more interesting. Lol. I really like the fact of your life willingness to go on so many solo's much respect for that. Do to my schedule I seem to have to do the same. We have pickerel in Florida but I've only eaten them cut into steaks prepared by some one else. Do they fillet decent I heard they were real boney? Thanks for the pics and write up. Thanks SwampHanger. I find pickerel much easier to process than something like bass. The skin is softer, and on the larger ones there is a good amount of flesh. They do have bones, but no more than bass or bluegill. The only problem is the slime. You have to wash them off very well. Nice trip Ross! Kudos on seeking out the small lake far from easy access. Those usually are hidden gems. Very cool trip report, looks like you had a great time!! Brought back a few memories of when I was a LOT younger- a buddy from school and I would take off like that to fish and camp. Always had a blast doing that!! Thanks for sharing another outing, greats pics too BTW! Thanks for the response Ross I usually catch them here with top water plugs fishing for bass. The next one I catch will go in the cooler for a meal. A couple of questions. How much assistance did the film crew provide and were there any tears before you headed home? The big Pickeral that snapped your line may have just bitten the line in half. Lol. Yeah, I was lucky to make it out alive. I use the Converse shoes because they fold up easily (no side wall) so I can fit them in my backpack. I've put screws on the bottom for traction. Our blueberry season just started here as well...so many lowbush blueberries to pick right now, our woods are full of them. It looks like a great trip! Thanks for taking us along.